Now, ahead of the release of his concert film One Heart, ARR, in a free-wheeling chat with DC, talks about the idea behind the movie. 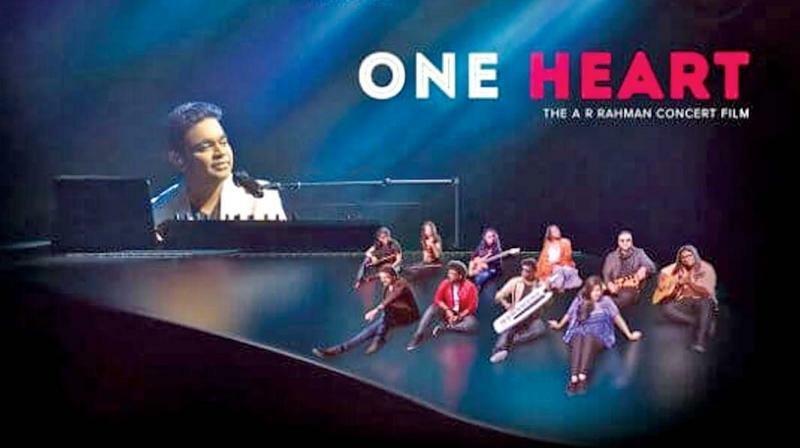 AR Rahman’s concert flick One Heart. One Heart is concert movie which has a runtime of one and a half hours. Normally, people would only get to see what we have performed on stage; they do not know what goes on behind. The rehearsals, practice sessions, brainstorming period about choosing the songs with the singers, and so on, are not available for the audience to see. We have access to these videos — and the core of the songs we perform in a concert is a mix of Hindi, Tamil and Punjabi. One Heart is not a typical movie. That said, it will have its share of emotion, fun and loveable moments. I assure you that it will be a new experience to the audiences. With proper production value and style, it has turned out to be an engaging film. The movie is directed by the YM Movies team. While we were touring, we were jamming and having fun — it felt magical. Hence I decided to capture those moments and treasure them. It struck me that I may not have the opportunity to perform with the same set of musicians again and I may not look the same as I do now! (laughs) Importantly, we might play different songs everytime — it may come out better or worse. So, the idea of filming the whole process excited me and we planned to record the concert in Austin. We had multiple cameras and recorded our training sessions for three days. A year later, we sat downand edited the content. After checking out the footage, we felt it could work as a movie. It’s about refining the whole experience by showcasing the memorable parts of a number than the whole song. In some cases, we talk about the philosophy behind the song and in others, share our experience about the entire show. We were performing with 60 back-up dancers — it was a spectacle indeed! We had even captured funny candid moments from the concert. That way, we can literally see the people interacting with the dancers and singers performing in Austin. I think Kochadaiyaan’s vision was as grand as Baahubali’s. But, things didn’t go well with the former. Everyone was praising Baahubali and that’s why I made the comment at Cannes 2017. Kochadaiyaan could have been that. Many failed attempts have happened earlier like Shekar Kapur’s Paani. Nobody believed an Indian movie could do so much. When you do something big and believe in it, it will succeed. When I was talking to my wife (Saira), she suggested the idea of doing a VR film on perfumes. I asked many about the idea — including Danny Boyle’s daughter — and they said it was possible to take on such an attempt. We found the technology and worked in the lab for six months, and with the perfumes, we experimented for eight months. Then, we got the required perfumes, it was packed in concentrated forms in cartridges and sent it to Japan to be analysed. We shot in Rome and the final editing is going on now! Watching this film will be a unique experience which the audience would not have experienced earlier. It is not about the movie per se — the smell is a part of the screenplay and you feel it while you watch the film. We are building a special kind of instrument which will be installed in the theaters. We can’t screen the film in normal venues! Special theaters/labs will be conceptualised for the screening of Le Musk. Since it was a new venture, I wanted to do tryouts first. With the help of some of the students from KM Conservatory, we shot the whole film with a dummy cast to check how it would turn out. Only then we did it with the real cast and shot the film in actual locations. Oh no! I am not all inclined towards politics. But, I hope that we get good leaders in the future. I have a physical trainer at home. My wife insists that I do keep my body fit at all times. I try my best! I do get triggered fast, but I have learnt to control my anger. I don’t take any decision when I am angry; I keep quiet and wait for everything to subside and then react. Otherwise, when you are angry, it is not ‘you’ who is answering — it will be your ‘ego’. And that could be destructive. I have given freedom to my children to pursue whatever they want to do. Ameen is interested in music. My first daughter is part of an NGO — she is very much attached to the foundation.